A person who parked their Mercedes-Benz in a lot at Edinburgh's Waverly railway station is going to have a very exciting scene when they return for their car. Because their car is now the solitary inhabitant of Parking Space Isle. The driver somehow ignored or moved the barriers cordoning off a parking area set to be resurfaced and improved, possibly thinking that the high-class nature of their sleek black Mercedes rendered them immune from having to pay attention to "cordons" and "barriers" like some poor schmuck would. Or maybe they're just, you know, an idiot. Incredibly, the workers didn't tow the car or pave over it with tarmac or, as far as I know, urinate into the fresh air vents. 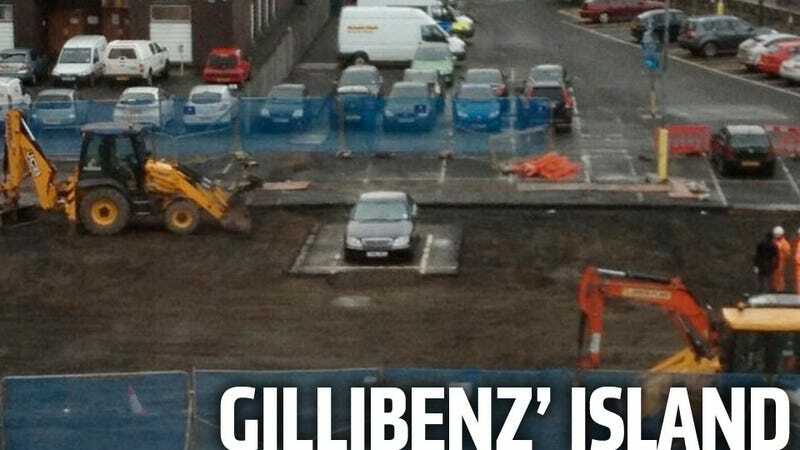 The workers got on with the job, and neatly cut a little 1 3/4 parking area for the car to live on. They even made a little ramp, in anticipation of the day when the prodigal owner would return, to much joy. "The car park had been cordoned off so we could begin work to resurface it and improve the lighting at the facility for our passengers. The motorist moved the barriers and parked in the worksite, but we've left a ramp for them to exit and will be happy to return their vehicle once they contact us." I just hope someone's there to tweet the expression on the owner's face when they come for their car. Also, someone should check to see if the Benz made friends with a volleyball. I'm told that's what people on islands do.